This text uses an integrated and interactive set of materials to teach students about the process of engineering design. Using a very strong engineering context and providing an experiential resource, this material exposes students to the cognitive and interpersonal skills required to execute the design process and introduces them to some of the productivity tools used by engineers. Phases of the design process are covered, which reflect the new ABET accreditation criteria. These areas include Defining the Problem, Formulating Solutions, Developing Models and Prototypes and Presenting the Design. Topics on Decision-Making, Communication, Collaboration and Self-Management are also presented, in order for students to learn how these various skills are best applied to each phase of the design process. 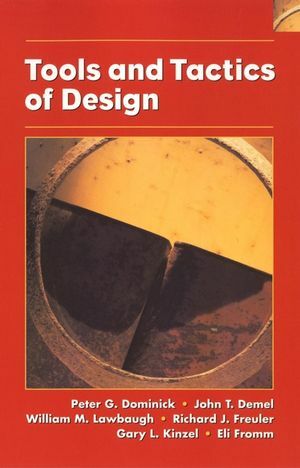 Suitable for a freshman/sophomore Introductory Design course, Dominick's book can also be used for some upper-level design courses. The text is meant to support student work on a variety of design projects regardless of engineering discipline. Peter G. Dominick and John T. Demel are the authors of Tools and Tactics of Design, published by Wiley. Emphasis on Team Skills. Students are guided through the principles and steps that promote team effectiveness. Self-Assessment Activities. Provides increased personal insight to strenghts and improvement areas along with a greater student involvement in the learning process. Intersects skills with phases of the design process "Just in Time approach". Includes specific tools and tactics students can use when working on their own projects. These are presented at the point in a design process when they are most likely to be applied "just in time". The focus is on skills and activities that transcend specific types of design projects. Use student projects as case examples. Heightens relevance of topics for students.